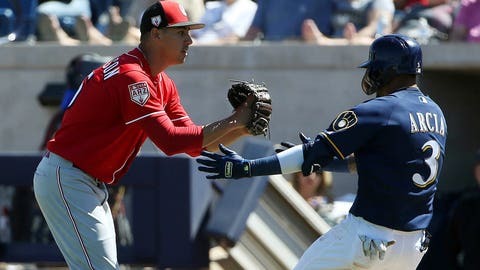 Zach Davies allowed four runs (three earned) on six hits in 5 1/3 innings, and the Milwaukee Brewers completed a comeback in their 6-4 win over Cincinnati on Friday. Reds jumped out to a 4-0 lead after two innings of play. But Davies settled down, and the Brewers bats got going. With the bases loaded and no outs in the third inning, Davies grounded into a double play. But it brought in Tyler Saladino, closing the gap to 4-1. Cory Spangenberg knocked in Yasmani Grandal on an RBI single the following inning. Orlando Arcia hit an RBI triple in the sixth, followed by a Spangenberg RBI double. Lucas Erceg hammered his third homer of the spring, a solo shot in the seventh inning that gave Milwaukee a 5-4 lead. The Brewers visit Texas on Saturday afternoon.